On my latest trip to the attic, I "discovered" a collection of German chess magazines from a great year I spent in Bavaria after graduating. Bavaria is beautiful, crazy, fantastic and a whole collection of paradoxs, but that's a heap of other stories. 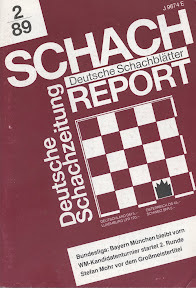 The magazine, Schach Report, is the German equivalent of the British Chess Magazine. It combined two publications, Deutsche Schachblatter and Deutsche Schachzietung. The February 1989 edition contains a host of interesting snippets. It was Candidates quarter final time, and surprise names had made it into the last 8: Canadian Kevin Spragget who was playing Artur Yusupov in Quebec, Icelander Johan Hjartarson up against Anatoly Karpov in Seattle, and Jonathan Speelman who had already defeated Nigel Short. The final match featured two 'expected names' Lajos Portisch up against Jan Timman in Antwerp. In the Bundesliga, defending champions Porz, strengthened by the arrival of two American GM's Larry Christiansen and John Federowicz, were putting some pressure on Bayern Munchen (top boards Wolfgang Hubner and Zoltan Ribli) the league leaders. Amazingly Wuppertal, a team that included Grandmasters William Watson and Daniel King languished at the bottom of the second division with no wins. Do any of you know Hergott's first name? And finally, a dispute was brewing up between FIDE and the Grandmasters' Association (GMA) in battle for power at the top of world chess, with Garry Kasparov refusing to play in anymore FIDE tournaments whilst Campomanes remained president. It wouldn't be chess without a FIDE dispute. I think his name was Deen.